I recently missed out on a white 1984 Le Mans III, but, sometime as one door closes, another opens. A good friend of mine got wind of a Mk1 Le Mans available for sale and passed it on to me! 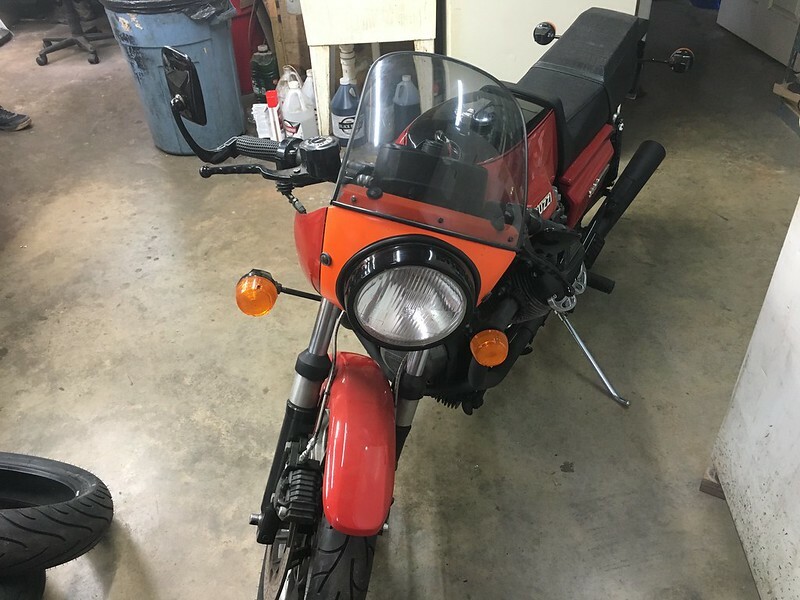 Take it on a cross country ride....you can sleep in one of the carbs at night. Thats a beauty, congrats! A buddy of mine has a '75, I admire it every time I see it and think to myself I want one! Does it run as good as it looks? I don't know yet, haven't started it -- needs a battery. It's been sitting a couple years, so, the carbs might need cleaned. I just ordered an Odyssey battery for it, hopefully it gets here bike the weekend. Not my first vintage Italian bike. In fact, my Ducati Monza is having some electrical issues right now. Man, I'm jealous! I've wanted a MK1 LM ever since I sat on one at the dealers back in 1979! Fantastic bike, quite small in stature, but excellent handling and brakes, and good top end speed. You would have been disappointed with the Mk3, especially with that stupid 16 inch front wheel, my mate Pete had a Mk3 and a Mk5, and couldn't get rid of them fast enough! He had a great T3 that he took up to MK1 LM specs and it was a beautiful bike, but the later (post Mk2) LM's were not as nice as the early ones. Congrats! looks great, congratulations! i've always had a soft spot for these. Have you ever rode one of these? If not, the torque steer will be quite a surprise. It turned me off of them definitely. Not a Lemans specifically, but, I've already got three Guzzis (and have owned several others), the Eldorado's 850cc is basically the same lump in a lower state of tune, but, with the same heavy flywheel. I also have two pre-1981 airheads (the 1980 and earlier ones have heavier flywheels than 1981-1995), and owned and ridden a few later ones too. It really is no big deal. 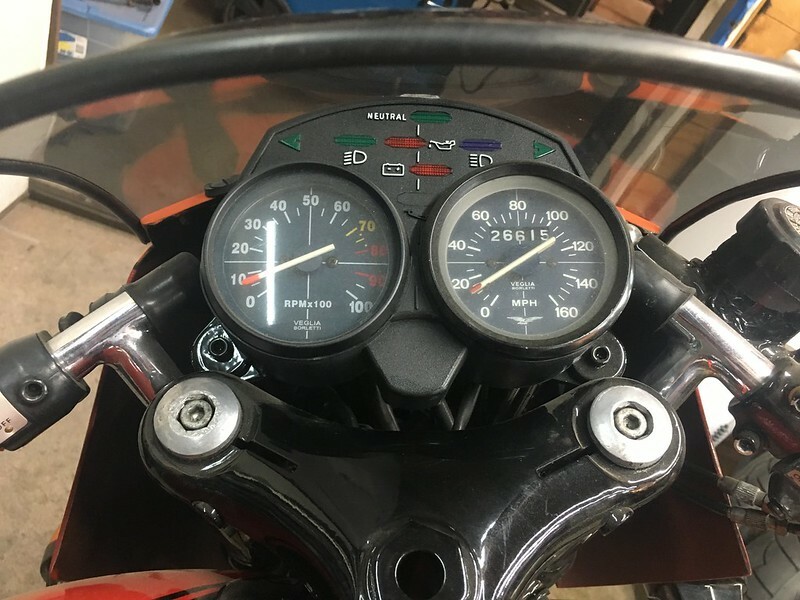 Torque steer is an "acquired feel", I experienced it on my brothers 1100 Yamaha, no big deal. It's never been a problem, and I've ridden them pretty hard. Wow! That's a lot of Le Mans! Yep, what a load of bullsh1t, old Guzzi's are no worse than rattly old BMW R series airheads, and handle way better, with better brakes! I've owned 5 airheads, and none of them were better rides than your MK1 mate. 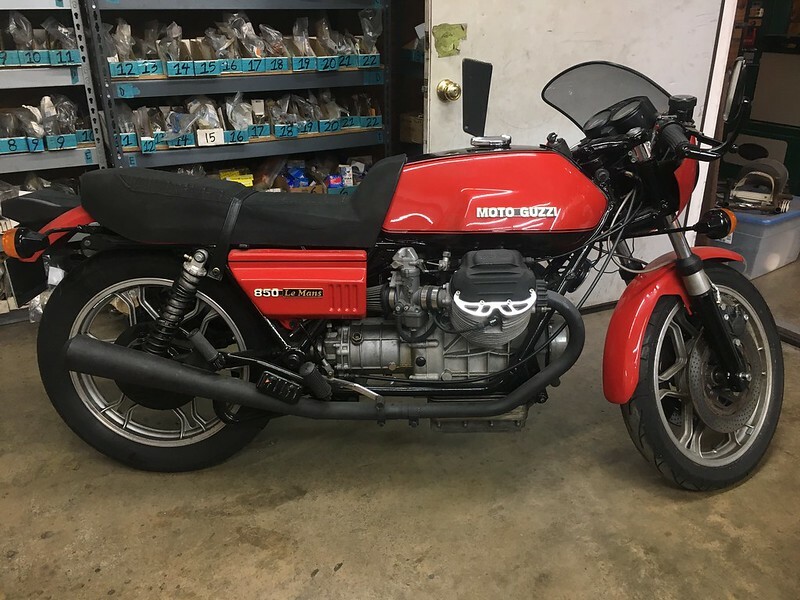 One of the most entertaining bikes I ever rode was a Mk II California Guzzi, absolutely loved it and the only time the engine rev/ flopping to one side occurred was at the lights and that was just amusing. A member here didn't believe I actually owned one, because I said you didn't need to tip the motor forward to adjust the valves. I had to resort to providing photographic proof of valve cover removal without motor tipping... henceforth, I will refer to my CBX as "imaginary"! Sounds like you need to rescue it from him. The bullsh1t is all yours, Terry. I have a "rattly old" BMW R100S and it has absolutely no torque steer. 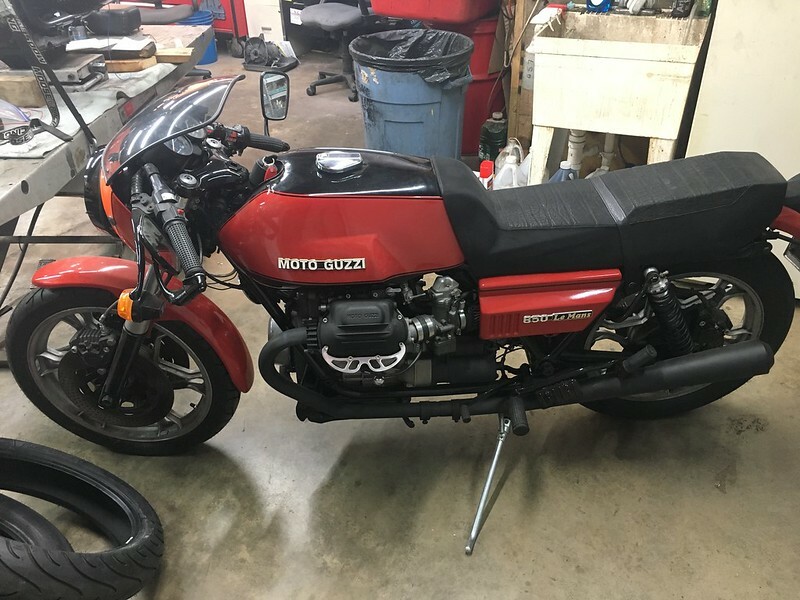 The Guzzi's massive torque steer is a well-known fact in the community. Maybe the ones sold in Australia have the two cylinders working in opposite direction to cancel this out. Or is it, because you are driving on the wrong side of the road? My personal experience on a LeMans was so bad that I decided I would never own one.